A new café was to be constructed and a 1200m2 thatched roof was required. The thatched roof had to be fire retardant, require no maintenance, have a long lifespan and be aesthetically in-keeping with the look of an African thatched roof. The thatch needed to be installed on top of a new profile steel roof, which was technically challenging due to the curved eave detail on both sides. It was important that we had flexible work patterns, were able to work alongside other contractors and finish the whole project as quickly as possible. Fibre Thatch® tiles were the perfect solution. Fibre Thatch® is a simulated thatch and is made from UPVC Polymer, with a minimum life expectancy of 50 years and a fire retardant rating to BS476 Part 7 Class 1Y. 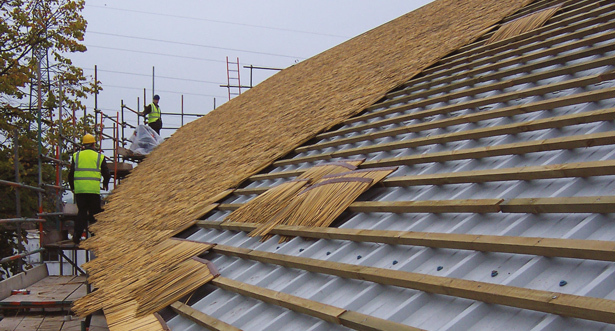 Thousands of Fibre Thatch tiles were stapled onto over 5 kilometres of battens which had been fixed onto the profile steel roof. On the verges, the Fibre Thatch® was wrapped around to make the gable ends consistent with the thicker eave sections. On the eave detail of the roof, Fibre Thatch® eave tiles were used to give an attractive natural finish and the impression of an authentic, 150mm thick thatched roof. A 52m colour-matched resin cap was installed along the length of the ridge. The complete installation of the thatch roof took under four weeks to complete. 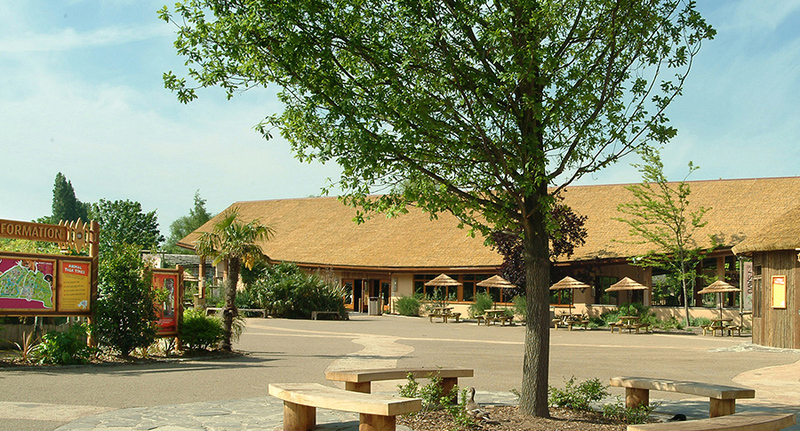 The whole roof has a natural thatch look which is in keeping with the aesthetics of the zoo and the natural habitat of the animals, yet has all the benefits of a synthetic product.